Host Steve Potter talked with Sharon Foehner, a musician with Rough Grooves, Dave Beardsley, the Publisher of stlblues.net and co-founder of the National Blues Museum, which is scheduled to open in Fall 2014, and Jeremy Segel-Moss, a member of the Bottoms Up Blues Gang and Vice-Chair of the St. Louis Blues Society. Beginning this year the St. Louis Bluesweek Festival will also feature a BBQ Battle Royale, in which thirty teams will battle to determine who has the best barbecue in St. Louis. 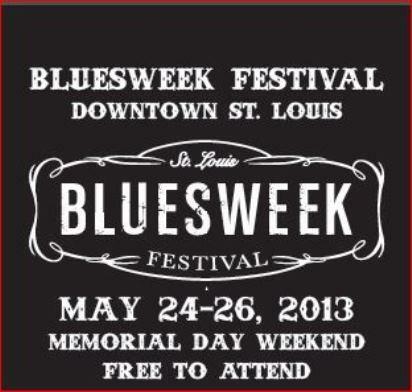 Friday, May 24, 2013, 5:30 - 11:00 p.m.
May 25 - 26, 2013, Noon - 11:00 p.m.